BACKGROUND: Foot infections represent a major health concern in the Veterans Health Administration as they often may lead to limb loss. A majority of these infections are associated with diabetes in the form of diabetic foot ulcers. 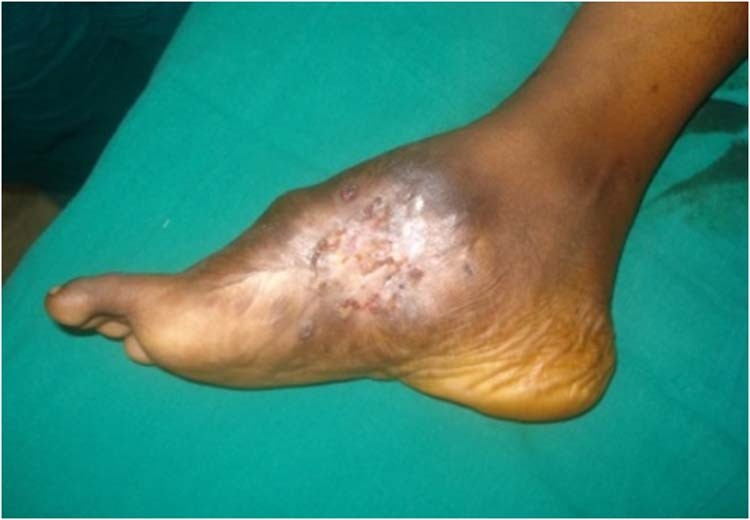 The diabetic foot infection is associated with a substantial mortality rate and often requires amputation to fully address the nidus of infection. METHODS: A retrospective chart analysis of all surgeries to treat foot infections in an 18-month period was conducted. Multiple variables- patient location, preventative primary care diabetic foot screenings, routine follow-up by a foot-care specialist, and pre-operative hospital admission- were reviewed and recorded. The data was analyzed using a one-tailed z-test and chi-squared tests. The one-tailed z-test provided a facility-specific data analysis highlighting areas which may benefit from education or assistance in terms of resource allocation. The chi-squared tests reveal generalizable findings regarding the association among primary care diabetic foot screenings, routine follow-up by a foot-care specialist, and the need for pre-operative admission. RESULTS: Results show an absence of routine follow-up by a foot-care specialist is associated with a statistically higher rate of patients requiring pre-operative admission. Conversely, those patients with routine follow-up required fewer admissions. Though not significant at conventional levels, a higher percentage of patients without the primary care diabetic foot exams also lacked specialty follow-up and necessitated pre-operative hospital admission when compared to patients with the screenings. CONCLUSION: This study provides an example of methodology reviewing pedal infection-related surgical data to perform effective limb loss prevention in the VHA setting. The generalizable results elucidate the role of the primary care and foot-care specialists in preventative medicine thereby avoiding a hospital admission. The current study suggests that a close, collaborative, patient-centered approach between primary care and podiatry results in better outcomes for patients. Foot infections are a major health issue in the Veterans Health Administration as they often jeopardize limb preservation and shorten the patient’s lifespan. A majority of these infections are associated with diabetes in the form of diabetic foot ulcers (DFU). The excessively high 5-year mortality rate associated with patients with diabetic ulcers reaches upwards of 55% . With chronicity, the DFU transitions to bone infection. A festering oste-omyelitis further propagates the pedal nidus of infec-tion resulting in a statistically higher rate of fatal sys-temic disease such as heart attack or stroke [2,3,4]. Consequently, 45% of all patients with a diabetic ulcer require surgery, often times a pedal amputation, to address the nidus of infection and reach resolution of symptoms . Effective preventative care can maximize limb preservation and improve life expectancy. As the single largest health care system in the United States, the Veterans Health Administration (VHA) is working to meet the complex needs of this dramatically increasing pathology . Primary care providers, podiatric surgeons, general surgeons, vascular surgeons, infectious disease physicians, and wound care nurses are integrated in the treatment of the diabetic foot infection. In the enormity of the VHA system, providers can be oblivious to the amputation-related statistics that may improve patient outcomes. A facility-specific assessment allows providers to better understand the events leading up to the amputation and prevent long-term loss of follow-up. Such evidence can inform future strategies to effect better prevention and management of the DFU pathology. The aim of this study is two-fold: 1) to provide an example of a retrospective statistical analysis assessing facility-specific data regarding preventative care and patient outcomes for the benefit of other VHA facilities and 2) to understand the associations among preventative primary care diabetic (PC DM) foot exams, routine follow-up by a foot-care specialist, and pre-operative hospital admission in the VHA setting. A retrospective analysis of all surgeries to address pedal ulceration infections between January 1, 2013 and June 30, 2014 were analyzed using one-tailed z-tests and chi-squared tests. The following data was collected for each infection-related pedal surgery: chronological surgery number, chronological patient number, location following the patient, whether a preventative PC DM foot exam was performed, whether the patient’s condition required pre-operative hospital admission, if so the date of admission and the reason necessitating admission, dates of podiatric/surgical/wound care follow-ups the patient had prior to admission or surgery (in the case of no admission), whether the patient was routinely followed or not followed by a foot-care specialist prior to surgery, the date of surgery, and an update regarding the patient’s condition. Patients who went on to have further limb amputation or endured further complication related to the pedal infection were classified as “poor prognosis.” On the contrary, patients who healed the surgical sites were classified as “healed surgical site.” A description of the data collected is detailed and summarized in Table 1 (see supplement within PDF). Table 1 was analyzed using both one-tailed z-tests (Table 2) to understand facility-specific trends and chi-squared tests (Table 3-5) to examine the association between PC DM foot screenings, routine follow-up by a foot-care specialist, and pre-operative hospital admissions. The locations from which the patient was referred included the main medical center: Wilmington, surrounding community based outpatient clinics (CBOC) A, B, C, and D, and a nursing home: Community Living Center (CLC). The CBOC facility location was withheld for this publication. Some patients were also referred from the neighboring Coatesville VA medical center. Patient follow-up data was not readily available from this facility, leading to the exclusion of patients originating from this location from the analysis. The variables (PC DM foot screening, specialty follow-up, admission, and surgery) measured in each facility were compared against each location’s outpatient population share as the base value (Table 2). Additional analysis was also performed to test for dependencies between the variables: preventative PC DM foot exams, specialty follow-up prior to surgery, and pre-operative hospital admissions (Tables 3-5). The PC DM foot exam is a clinical reminder to be completed by the primary care provider as required by “VA/DoD Clinical Practice Guidelines for the Management of Diabetes Mellitus in Primary Care“ . This reminder ensures that DFU prevention is performed in the primary care sector. This alert is only activated at the anniversary of the patient’s last exam. The alert remains active until the test is performed by the provider at which point the test is de-activated for another calendar year. If the PC DM foot exam was either not performed or performed within a week of admission or surgery, the exam was considered non-preventative as it served no preventative use once the patient required surgical intervention. Table 2 One-tailed test comparing the variables measured in each location. Statistical significant findings are in bold. Down-arrow: Findings are statistically lower than expected. Up-arrow: Findings are statistically higher than expected. Table 3 Χ2 = 9.9676, p = 0.008. A statistically significant relationship was found between patients who were not followed by a foot-care specialist and those who were admitted. The specialty follow-up dates, (as listed in column 5 in Table 1), dictated if the patient was adequately followed by a foot-care specialist (as noted in the adjacent column, column 6). By recording the patients’ last 3 podiatry, surgery, or wound care visits, the investigators were able to assess if the patient had regular follow-ups prior to surgery. At these visits, all components of the diabetic foot exam were assessed. ADA guidelines suggest that a high-risk patient with a history of amputation or ulceration be seen by a specialist every 1-2 months . To give the patients and providers some leeway, the patient was considered “not followed” if he/she was not seen within 3 months preceding admission or surgery. Table 4 Χ2 = 2.0563, p=0.152. No statistically significant association was found between patients who did not have a PC DM foot screening and those who were not followed by a foot-care specialist. However a higher percentage of patients who had a PC DM foot exam were also followed by a foot-care specialist. The converse also held true. Table 5 Χ2 = 1.6067, p=0.205. No statistically significant association was found between patients who did not have a PC DM foot screening and those who were admitted. However a higher percentage of patients with no PC DM foot exam were admitted compared to patients with a PC DM foot exam. Similarly, most of the patients who were not admitted had a prior PC DM foot screening. Over the 18-month period, 53 surgeries were performed to treat foot infections on 44 patients. Of these surgeries, 92% were amputations (n=49). Fifty-six percent of the surgeries (n=30) required pre-operative admission. Of the admissions, 95.8% occurred secondary to a foot infection. Only 3.7% of the surgeries were performed on non-diabetic patients (n=2). Forty-four percent of the surgeries were performed on patients who were not followed regularly (<3 months). As a result of foot infection, 7.5% of the pedal surgeries (n=4) were associated with further limb amputation. Five of the surgeries were classified as “poor prognosis”, i.e. the patient was expected to or did lose limb or life and was associated with an unresolved pedal infection. One of these patients, healed the surgical site but subsequently developed severe hypotension, multiple bodily pressure lesions, and died from septic shock. The one-tailed z-test was used to identify patterns within the variables that were disproportionate to that facility’s population share. For example, a CBOC serving 15% of the population would be expected to account for 15% of the performed surgeries. This location-specific analysis demonstrates significantly fewer infection-related pedal surgeries, missing PC DM foot exams, and pre-operative admissions out of the Wilmington facility than would be expected relative to its population share alone (table 1). In contrast, CBOC A has a significantly higher rate of surgeries, missing PC DM foot exams, and admissions than its population share would suggest. CBOC C also has more admissions than would be expected, but the number of surgeries and missing PC DM foot exams are not overly disproportionate to its population. Additionally, a higher than expected number of patients were regularly followed in CBOC C prior to surgery. As expected with the typical nursing home population, the CLC has a higher rate of surgery, specialty follow-up, pre-operative admissions, and poor prognosis (60%). No significant findings were noted in CBOC B and D.
Although the above results are idiosyncratic to the Wilmington medical center and surrounding CBOCs, patterns identified in the aggregate data are generalizable to other VHA systems. Chi-squared tests were used to assess bivariate statistical dependencies in which the presence or absence of one factor influences the rate with which another factor occurs. Analysis confirmed a significant relationship (p=0.008) between patients who were not followed by a foot-care specialist to those who necessitate pre-operative admission (table 2). The observed relationship suggests that high-risk patients who are not routinely followed by a foot-care specialist are more likely to require admission than those who are routinely followed. In fact, the odds of a patient without routine specialty follow-up requiring pre-operative admission is roughly 7.5 times higher than for a followed patient. No statistically significant relationship was found between patients without PC DM foot screenings and those followed (p=0.152) and admitted (p=0.205) at conventional levels (table 3, 4). However based on percentages, certain trends among these variables seem apparent. Patients without the preventative PC DM foot screenings tended to also lack follow-up by a foot-care specialist (table 3). The converse also held true. 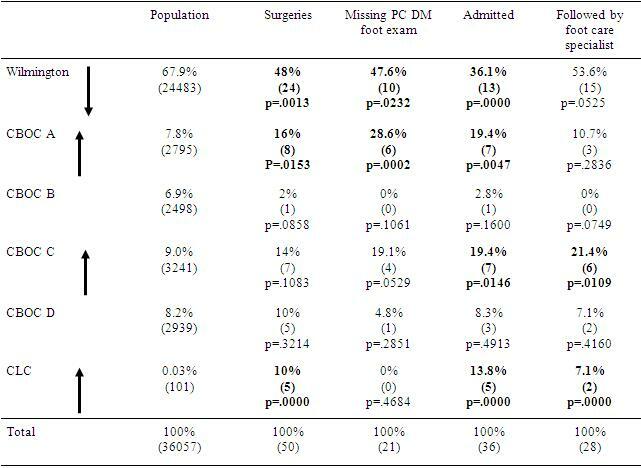 Similarly, a higher percentage of the patients without the PC DM foot exam required pre-operative hospital admission when compared to patients with the screening (Table 4). The Wilmington facility was associated with statistically fewer infection-related pedal surgeries, fewer missing PC DM foot exams, and fewer admissions than its population share would suggest. This site had fewer adverse events preceding the patient’s surgery and overall fared better in the preventative arena than its CBOC counterparts. These comparatively better outcomes coincided with the most resource-intensive location. As a result, the Wilmington facility assisted in the evaluation in slow or non-healing ulcer patients from the CBOC facilities. The overlap between CBOC C patients who required surgery and those were admitted was 100%. Moreover, 85% of these surgeries were associated with routine follow-up prior to surgery. These clinical outcomes are suggestive of a lack of efficacy in preventative care in this location. In CBOC A, 87.5% of surgeries required pre-operative admission, which is significantly higher than would be expected based on its population share. Our solution was to request the foot-care specialists in both CBOC A and C to send all non-healing ulcers with a duration greater than 3 months to Wilmington for evaluation and possible treatment. In terms of resource allocation, funds for part-time nail technician were requested for CBOC A and C to allow the providers to focus on the higher risk patient population. Additionally, 75% of surgeries out of CBOC A did not have preventative PC DM foot evaluations in the year prior to surgery. Our remedy was to present a facility-wide educational lecture discussing these results and the importance of preventative care in the treatment of DFU. As expected, patients residing in the CLC were associated with a higher rate of pedal surgery with subsequent limb amputation. With its census of patients who are elderly, immobilized, poorly-vascularized, non-responsive, or systemically complicated, a proper treatment addressing the nidus of infection is often not accomplished. We advised the dedicated CLC wound care nurse who performs weekly wound assessments to consult podiatric or general surgery for new wounds in a timely manner. In addition, the Wilmington wound care nurses have assisted in CLC management and prevention of ulcers. The current study demonstrates the value of collaboration between primary care and specialty care for the treatment of diabetic foot infections in the VHA setting. It is the first in its class to present an example of methodology reviewing pedal amputation and infection-related surgical data for limb loss prevention in the integrated VHA system. This facility-specific research focusing on the circumstances surrounding surgery was conducted to assess the efficacy of preventative measures and effect change to better patient outcomes. As it stands today, data collection and analysis for the purpose of limb preservation is not a routine occurrence in the VHA. The present study uses the data collected to highlight areas of concern and allow implementation of minor changes to effectively manage high-risk diabetic patients. This methodology can be applied in any facility and may directly impact departmental reorganization, resource allocation, and provider or patient education. The present research is also suggestive of a collaborative relationship between of primary care and foot-care specialists in the management and mitigation of diabetic pedal infections. Prior to this study, the associations of these variables and the need for pre-operative hospital admission were not evident. Our results encourage a partnership between primary care providers and foot-care specialists, including podiatrists, general surgeons, and wound care specialists for early detection of pedal infections, thereby minimizing the need for pre-operative hospital admissions in VHA facilities. Results indicate CBOC A was associated with a higher rate of surgical interventions for foot infections as well as a lower rate of completed preventative PC DM foot exams. One explanation suggests that fewer providers examining the diabetic foot may lead to undetected foot ulcers, propagate the infection, and result in an amputation. Previous studies have indicated that an increased number of providers examining the diabetic foot resulted in fewer infection-related surgeries [9,10]. A study originating in Sweden demonstrates a lower amputation rate in a region in which patients were referred by a variety of providers in contrast to only referrals from general practitioners, suggesting that the more providers examine the diabetic foot, the earlier infection is treated . Another analysis documents the reduced rate of amputation with early detection of DFU . With the addition of nail technicians, we increase the number of providers examining the diabetic foot. Along with the current study, these investigations illustrate the importance of cross-collaboration between specialties for the early detection and subsequent referral to a specialized diabetic wound care team. Patients originating from CBOC C were routinely followed prior to surgery but nonetheless required admission prior to surgical intervention. This finding questions the efficacy of preventative treatment received in this facility and is suggestive of the need for education, resources, or further referral to a more specialized team. Similarly, CBOC A was associated with a significantly higher than expected rate of surgeries and admissions. As a hospital admission rather than an outpatient consult usually confers a more serious infection, the presumption that superficial infections are permitted to devolve into deeper more consequential infections is suggested. One plausible hypothesis to explain the higher rate of amputations is that care may not be adequately appropriated for the higher risk patients. Often times, VA podiatric providers are inundated with the lower risk routine nail patients leaving limited resources available for the higher risk patients with ulcers. The American Diabetes Association task force recommends that high-risk patients (history of ulceration/amputation) be evaluated by a foot-care specialist every 1-2 months, whereas low risk diabetic patients may be evaluated annually by a primary care provider or specialist when necessary [8,12-14]. 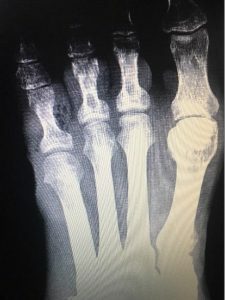 The addition of a nail technician in CBOC A and C could offload the low-risk patients allowing the providers to focus on the patients at a higher risk for amputation. Moreover, the request for the CBOC facilities to refer their long-standing DFU (> 3months) to the Wilmington facility benefits the CBOC patients. With the Wilmington facility having statistically lower rates of infection-related surgeries and admissions, the patients in the lesser performing facilities are likely to have more positive clinical outcomes with an earlier referral. 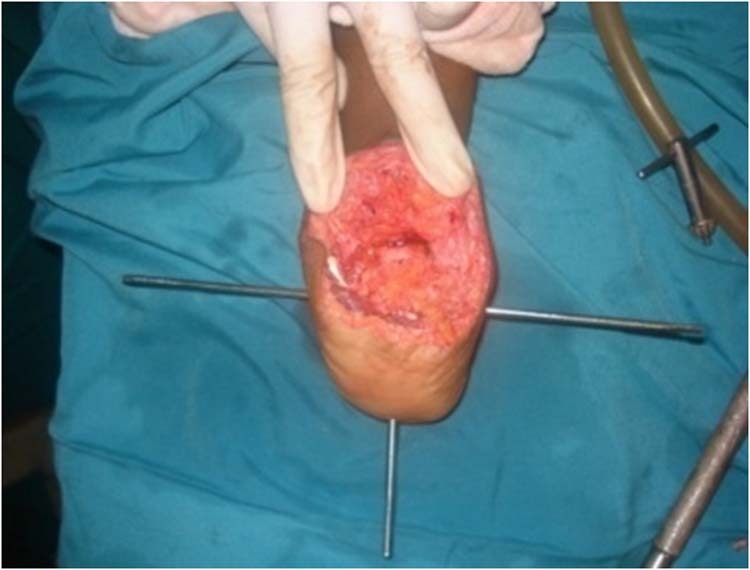 The purpose of the study was not necessarily to avoid pedal amputation but to maintain optimal compliance in the events preceding the surgery. Many providers have associated the word “amputation” with a negative connotation as in the case of “amputation prevention.” However evidence-based medicine suggests that patients who avoid amputation and live with chronic osteomyelitis generate a chronic inflammatory response by triggering vascular atherosclerosis [3,15]. A population-based study in a cohort of 23 million studied the relationship between chronic osteomyelitis and coronary heart disease . Once the researchers controlled for age, gender, hypertension, diabetes, hyperlipidemia, and stroke between the control and chronic osteomyelitis cohorts, they found a significantly elevated risk of heart disease- a 95% increase- as compared to the control population . Similar findings were supported in a meta-analysis study evaluating the association of the DFU and cardiovascular mortality . Results showed a substantially increased risk of all-cause mortality, fatal myocardial infarction, and fatal stroke in patients with DFU . These studies are among the growing number of studies that support a timely resolution of the DFU thereby preventing limb loss and increasing life expectancy [3,15-20]. The 30-day mortality rate, cardiovascular outcomes, and pulmonary events associated with a pedal amputation is substantially lower (4x) than below-knee or above knee amputations [17-20]. The goal is not simply to avoid amputation but to recognize the time-sensitivity of reaching a permanent resolution, thereby broadening our perspective to prioritize limb and life preservation. Results derived from the full dataset suggest that the more high risk patients are followed by foot-care specialists, the less likely the infection will progress to a degree that necessitates admission (table 2). On the patient-level, routine follow-up generally translates to earlier detection of infection or vascular impairment, fewer systemic complications, and lower potential for nosocomial infections. From the facility standpoint, a substantial financial and economic burden can be obviated for each avoidable hospitalization. Studies show that on average each hospital admission for a pedal amputation costs the facility is approximately $32,000 . This confirms the role of foot-care specialists in the treatment of diabetic foot infection and limb loss prevention as documented in previous studies [22,23]. The present study also demonstrates a positive trend between PC DM foot screenings and follow-up by a foot-care specialist in the VHA setting (table 3). Thus the domino effect between the absence of PC DM foot screening and patients necessitating pre-operative admission is evident. The direct impact of fewer PC DM foot screenings and a higher rate of admission follows a negative trend, though not statistically significant at a conventional level (table 4). The current study, specific to the VHA system, is among the increasing evidence supporting the interdepartmental collaboration to improve patient outcomes and reduce complications [23-25]. Limitations to this study are inherent to any retrospective analysis in that all variables cannot be examined. Regarding the one-tailed z-test, extraneous variables such a provider methodology, patient non-compliance, reason for lacking specialty follow-up, or location-specific resources such as casts, grafts, or personnel assistance were not assessed. However, these extrinsic factors do not diminish current results highlighting areas that may benefit from assistance or modification. This study provides perspective in regards to the number of surgeries rather than the number of patients. Therefore, some patients had repeat infection-related surgeries; this variable was not assessed. In regards to the chi-squared tests, the variables studied (specialty follow-up, PC DM foot assessments, and pre-operative admission) are generalizable among the VHA facilities nationwide. However, small sample size biases against statistically significant results. For example, the findings regarding PC DM foot screenings and specialty follow-up or admissions are likely to be significant by conventional standards with a larger sample following the current trends. Future research specific to the treatment of pedal infections or DFU may help determine which strategies and wound therapies will improve amputation prevention in this high-risk population. We encourage all VHA facilities to retrospectively assess the variables affecting patient outcomes and study the associations between these variables to better patient outcomes. In summary, by focusing on the situations surrounding the surgical treatment of pedal infections or amputation, each facility is able to perform self-assessments to improve patient care. We believe that only with a self-investigative approach can limb preservation be legitimately pursued. By assessing relevant variables we demonstrate the value of foot-care specialists and primary care providers in the treatment of diabetic foot infections in a VHA facility. This patient-centered approach facilitates earlier detection of infection, mitigates systemic complications, decreases the economic burden to the facility, and ultimately minimizes limb loss. With interdepartmental collaboration, we are able to prioritize limb preservation for veterans who have already sacrificed so much. With the increased movement of the world population, familiarity with the clinical picture of the Madura foot is of growing importance beyond its original endemic areas. The characteristic triad of symptoms consists of indurated swelling, multiple sinus tracts with purulent discharge filled with grains and localization at the foot. An increasing number of new etiologic agents are recognized today. For a better choice of therapy an adequate diagnostic procedure is essential; a deep biopsy for histology appears to give a more substantial contribution to identification of the causal organism than culture. The treatment which should be started early is at first essentially a drug treatment. However, in spite of high expectations with regard to new antimycotic drugs, amputation or disarticulation is often inevitable even today, particularly when the lesion is caused by Eumycetes. 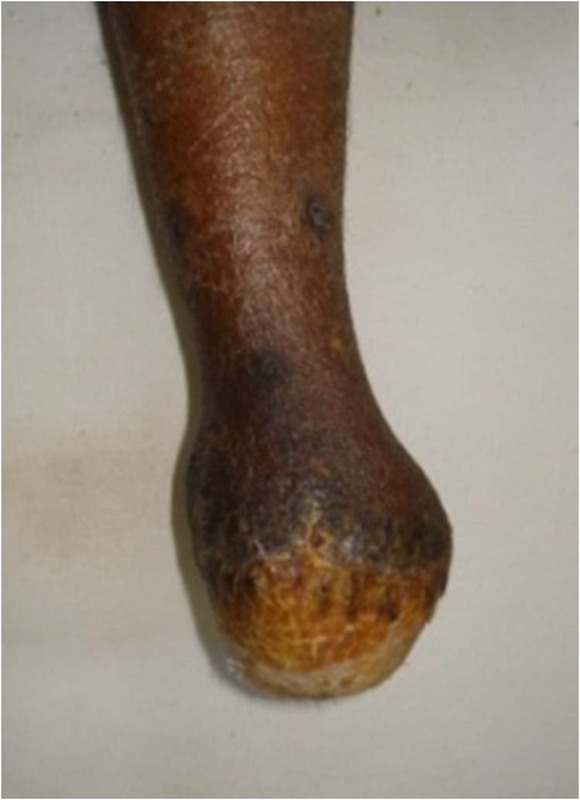 We present a case of eumycotic mycetoma with extensive involvement of foot for which a Boyd’s amputation was done and treated with antifungal therapy with no recurrence. Key words: Osteomyelitis, amputation, Mycetoma, Madura foot. The infectious organism is presumed to be directly inoculated after penetration of the skin with a sharp object, such as a thorn. Clinically it presents with painless subcutaneous nodules and fistulae from which a purulent exudate may be discharged. Histologically the nodules contain microabscesses and a surrounding granulomatous reaction. The treatment which should be started early is at first a drug treatment. However, in spite of high expectations with regard to new antimycotic drugs, amputation or disarticulation is often inevitable even today, particularly when the lesion is caused by Eumycetes. Although the clinical picture is characteristic, diagnostic confusion may occur with chronic bacterial osteomyelitis, especially when bone destruction has occurred. Botryomycosis can give a similar picture. This is a chronic bacterial infection caused by gram positive cocci (Staphylococci, Streptococci) and gram negative bacteria (Escherichia coli, Pseudomonas, Proteus) that can lead to subcutaneous swelling and draining fistulas. Like mycetoma, grains (colonies of bacteria) can be found in suppurative discharges and biopsy specimens. In botryomycosis however, organs can be affected too. Neoplasms (benign and malignant) should be excluded as well. 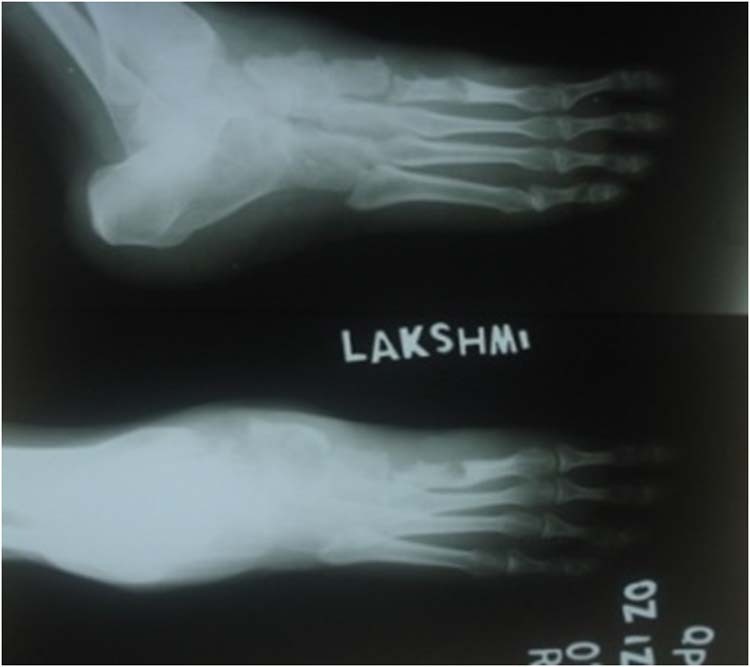 A 35-year-old woman from Tamil Nadu, India presented with a 24 month history of a steadily growing lump in the region of the first metatarsophalangeal joint of her right foot. She was treated elsewhere with first ray amputation and itraconazole for 2 months, but patient came to us with multiple sinuses with discharging black granules. (Fig. 1) General examination was unremarkable with no lymphadenopathy or other soft tissue masses. Though the clinical picture was characteristic, differential diagnoses of chronic bacterial osteomyelitis, botryomycosis were also considered. 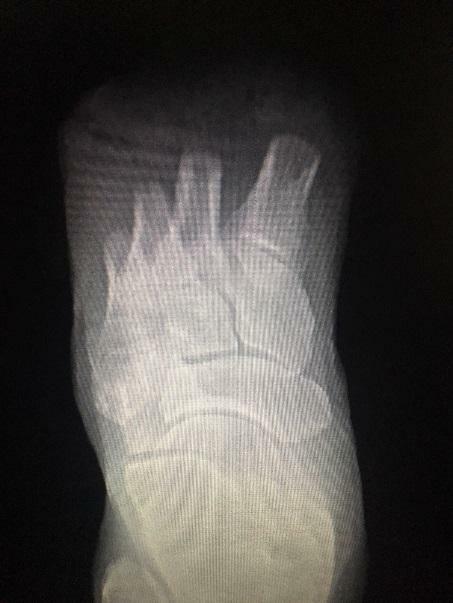 Figure 1 Clinical photograph of Madura foot. 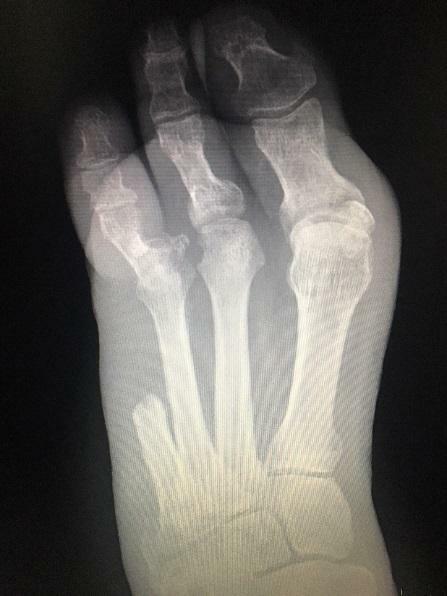 Figure 2 Radiograph of Madura foot with a multiple lytic lesions in tarsal and metatarsal bones. 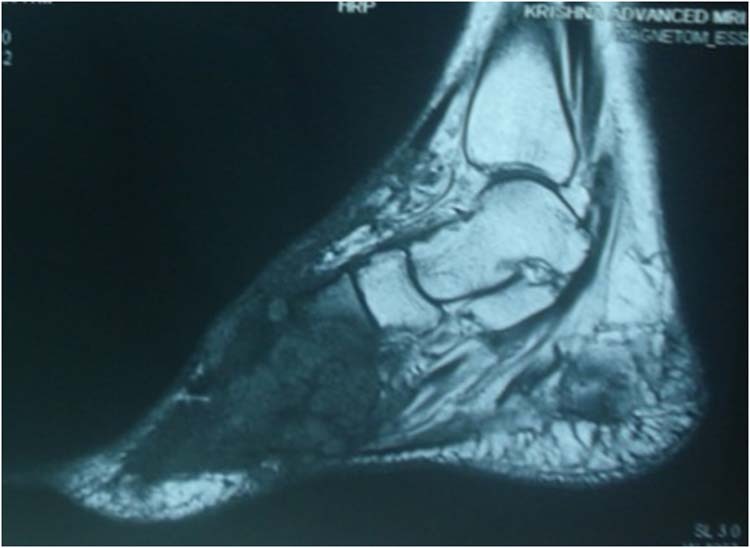 Figure 3 MRI showing multiple lesions of high signal intensity measuring a few millimeters across involving all the metatarsal and tarsal bones except the calcaneus. A biopsy was performed under ultrasound guidance. Histological features were suggestive of an inflammatory condition with no clear evidence of malignancy. Since the disease was chronic in nature and the patient had taken antifungal treatment for a very long time with no signs of resolution, we planned for an amputation. We discussed in detail the patient’s options including below knee, Syme’s and Boyd’s amputation. A wide excision was performed due to extensive soft tissue tumor and Boyd’s amputation was performed. A talectomy and calcaneo-tibial arthrodesis was performed by using a Charnley’s compression device. (Figs. 4A and 4B) Histological examination of the resected tissue revealed chronic inflammation with visible fungal hyphae. 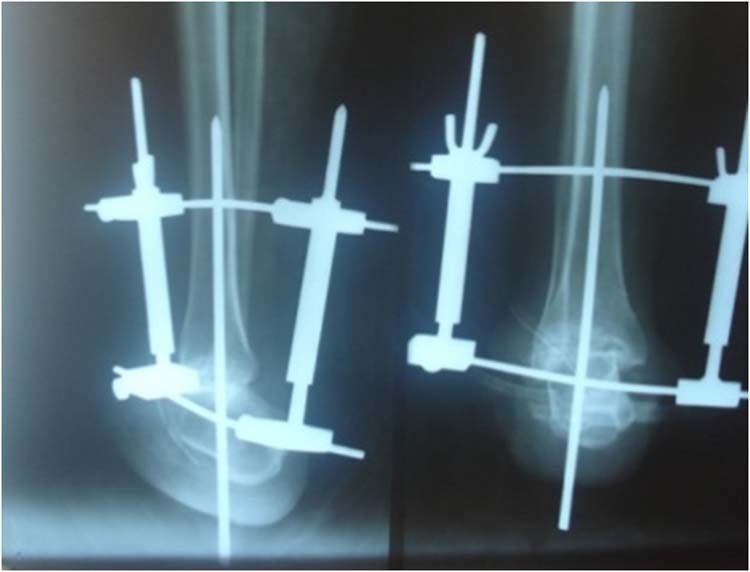 Figure 4A and 4B Intraoperative photo showing tibiocalcaneal arthrodesis stabilized with a Steinnman pin. 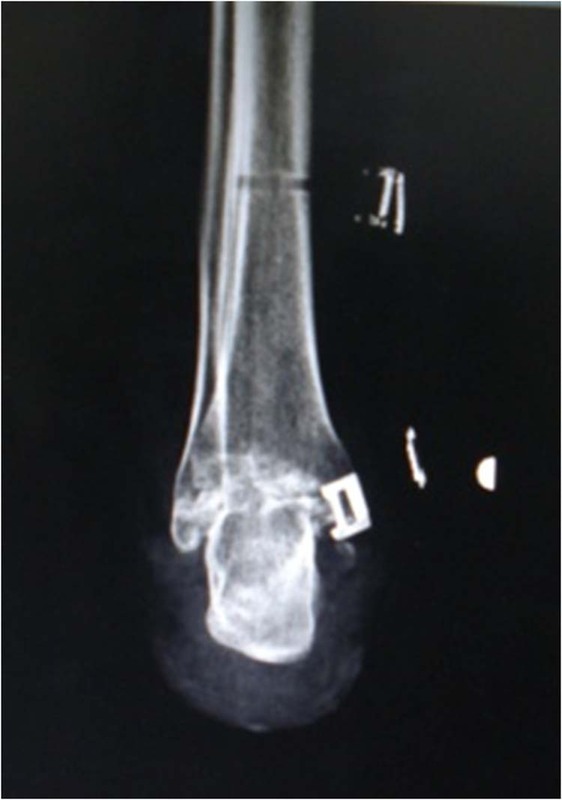 (A) Immediate post-operative radiograph showing Charnley’s compression device in place to stabilize the arthrodesis. Figure 5 Boyd’s amputation 6 months after surgery showing functional os calcis. Figure 6 Boyd’s amputation 6 months after surgery showing functional stump. Mycetomas are frequent in the tropical zones of America (Mexico and Venezuela), Africa (Senegal, Sudan) and Asia (India), but can also be observed beyond these areas. Bidie and Carter gave a full description of the disease. Dieng, et al., report 130 cases of mycetoma in Senegal from 1983 to 2000. After 14 months of follow-up, there was no evidence of recurrence. The stump of the Boyd amputation has sound plantar skin with good blood supply and sensation. 1. Shadomy HJ, Utz JP. Deep fungal infection. In Fitzpatrick TB, Eisen AZ,Wolff (eds). Dermatology in General Medicine. 4th edition New York, McGraw Hill 1993, 2472-2475. 2. Lupi O, Tyring SK, McGinnis MR. Tropical dermatology: fungal tropical diseases. J Am Acad Dermatol 2005 53: 931-951. 3. Picou K, Batres E, Jarratt M. Botryomycosis: a bacterial cause of mycetoma. Arch Dermatol 1979, 115: 609–610. 4. Magana M, Magana M. Mycetoma. In Demis DJ (ed). Clinical Dermatology. 26th edition. Philadelphia: Lippincott Williams and Wilkins. 1999, section 17–24, 1–22. 5. Boyd HB. Amputation of the foot with calcaneotibial arthrodesis. JBJS 1939 21: 997-1000. 6. Mills KL. Guide to Orthopaedics. Volume I. Edinburgh, Churchill Livingstone Ltd, 1981. 7. Ruxin T, Steck W, Helm T, Bergfeld W, Bolwell B. Pseudallescheria boydii in an immunocompromised host, Successful treatment with debridement and itraconazole. Arch Dermatol 1996, 132: 382 – 384. 8. Cathrine AN, Bhattacharya K, Srinivasan V. Mycetoma leg a–case report. Int J Low Extrem Wounds. 2003 2(3): 171-172. 9. Sundaram C, Umabala P, Laxmi V, Purohit AK, Prasad VS, Panigrahi M, Sahu BP, Sarathi MV, Kaul S, Borghain R, Meena AK, Jayalakshmi SS, Suvarna A, Mohandas S, Murthy JM. Pathology of fungal infections of the central nervous system: 17 years’ experience from Southern India. Histopathology. 2006 49(4): 396-405. 10. Dieng MT, Sy MH, Diop BM, Niang SO, Ndiaye B. Mycetoma: 130 cases. Ann Dermatol Venereol 2003 130(1 Pt 1): 16-9. 11. Fahal AH. Mycetoma: a thorn in the flesh. Trans R Soc Trop Med Hyg 2004 98(1): 3-11. 12. Lichon V, Khachemoune A. Mycetoma: a review. Am J Clin Dermatol 2006 7(5): 315-321. 13. Altindas M, Kilic A. Is Boyd’s Operation a last solution that may prevent major amputations in diabetic foot patients. J Foot & Ankle Surgery 2008 47 (4): 307-312. Address correspondence to: Dr. Mohan Kumar, PESIMSR, Kuppam,India. 1 Consultant in Arthroscopy & Sports Medicine, PESIMSR,Kuppam,India. Assistant professor, Dept of Orthopaedics, PESIMSR, Kuppam, India.